Dufftown Speirin's is a local newsletter made in Dufftown by the Dufftown Speirin's Newsletter Association. 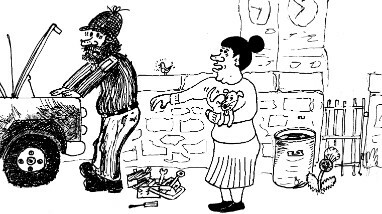 "Speir from Old Scots:- to ask to enquire"
Our aim is to provide a magazine for local clubs, groups and organisations in the Dufftown area to promote themselves and also to build community. We are very interested in local history and photographs of the near and distant past. We feature local poets, artists, authors and photographers. We support Dufftown and local businesses with advertising and information. We are keen to promote the image of the area, its paths, and to care for the town and its assets and report on the work of those hard working individuals in the town that share the same aim. Volunteers deliver the Speirin's around Dufftown and the surrounding area. Copies available at the Coop and Costcutters Dufftown, Cattanachs Paper Shop Aberlour, Baggs in Elgin, Mither Tongue in Keith, and the Abergeldie bar Holburn Street Aberdeen. Our constitution can be viewed by clicking this text! Up the Glen, by Willie Collie. Before I go any further, I would like to tell you of the 1841 census of the Glen which I have been reading lately. I was very surprised at the number of people that lived there. At Mid Bellandy, there were two families of Mc Conachies with a total of 19 people Nether Bellandy had 15 and all al Bellandy numbered 52. All the other farms and crofts had similar numbers. These numbers continued till the early 1900’s when the old school on the back road’s role peaked at 100 scholars. You wouldn't believe this now but at this time it even prepared students for University. Another interesting thing I found is a weaver at Ellivred and a dressmaker at the Mill of Laggan. Then hard times came, and the population began to shift. Way back when I was young I can still remember many folk working in the larger farms however the small crofts lay neglected and partly derelict. Edward McPherson was the last of the real crofters to leave. He managed to farm a few of these crofts and made a go of it building up to a small farm. He was a bit of a character and wrote some great poetry and had some of them published in the local paper, He was also a great story teller. His picture is printed in the first page of a book by David Stillet on illicit whisky. He told of how some of his ancestors made whisky in secret hideouts around the crofts . He also had photos of what he called whisky bothies by the burn side. I had a good look at them and was told of their locations. If you go there now it would look just like an area where stones had been gathered off the fields and dumped over the bank. I have no doubt though that whisky had been made there at one time, it would have been very secluded.I mine him telling me of the still that was clean deen and too worn out to be of any use. Somebody mentioned that the excise men had wind of the illegal whisky making activities in the area and were paying good money for information. The worn out still was set up in a secluded part of the Glen, far away from the croft. A fire was set and left to burn out then some other distilling paraphernalia was left lying around to make it look like the still was in regular use. The Excise men were informed of the illegal activity and off they went to the still to stake it out and catch the alleged culprits. They watched over the area for a good long time to see if any one would come to use it, But of course no one ever did. Eventually they gave up and the still was taken away and everything was dismantled. The Mc Phersons were thanked for their help in putting an end to this diabolical illegal activity and were rewarded. The reward money was more than enough to pay for a new still. We have all heard of Mc Phersons Transport from Aberlour, well! The Mc Phersons ancestors came from Upper Folds Just across from Sheandhu. 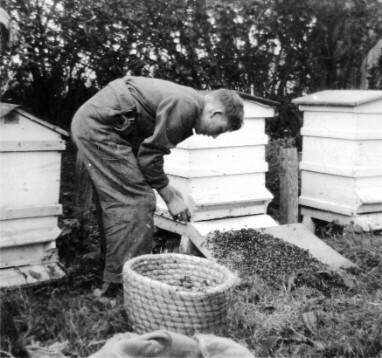 (Above) Willie as a young lad tends bees at a neighbouring farm. By the time I went to school in the back road the role had dropped to just 20. All the time I was there, just the one teacher taught all the classes. Mind you, I do remember we did have 3 different teachers through my schooldays. Firstly I remember Mr Strathdee for a short time then Mrs Copeland, she was very strict and would stand for no nonsense you dare not misbehave, looking back I realise now she was a very good teacher, though we did not realise that at the time. Mrs Copeland left and then we had Mrs Murray. After I left the school on the back road I was off to Mortlach Secondary School. I remember back in our schooldays Halloween would come round and we would go out guising with our neep lantern on the horse and kert. We went round all our neighbours and had to do a party piece of some sort to get a reward and at that time the teenagers took great delight in playing practical jokes on the younger guisers One of the pranks played was on Geordie Leslie at Knockanbeg while he was indoors doing his party piece, they all gathered round his horse kert with the big wheels on it and stripped it down then carried it through a wee door in the steading and rebuilt in there in record time, then disappeared into the night. The carts were an easy target to hit. When we started to go out guising we weren’t warned about this problem. Here we were in a farm house giving it laldy when out in the byre the fermer have just quickly nipped out to have a quick check on the cows, then as he was just away to head back in to hear the last of our performance when he hears voices not too far way. Quickly he jalouses what is afoot and hides himself in our kert. Sure enough the rouges creep up in intent on some devilment. Suddenly the mannie jumps up, howling an ungodly noise, the perpetrators take off hastily and from then on were never known to come back playing their tricks again. When I was young there was no electricity no TV only the battery powered radio and paraffin lamps for light. A few folk had cars but not many. If you had to go somewhere you had either to walk or bike but there was also Lows busses which ran from Tomintoul to Dufftown. From there you could catch the steam train to Elgin then on to Aberdeen or Inverness. When I was a nipper everyone in our area got their groceries from the local shop at Lochterlandoch it had a telephone box, petrol pumps and was also the Post Office. Also there was the Watt Brothers travelling shop. The van came round the back road on a Friday and up the main road on Mondays. The van carried every thing you could ever need back then, but then again we didn't have the wide choice back then that we have now. It also collected eggs from farms these were sent to the packing station at Keith for grading. When my Mother went to pay her groceries she usually found that the egg money was enough to cover the cost. When winter came round I remember a big bag of oatmeal being delivered also flour for baking. Back then it was always porridge for breakfast. I remember fine the 13 Friday’s in a row that the van didn't manage to get up the farm road due to the snow. Dad had to walk down the farm track to the main road to collect the messages once the back road had been cleared. Now we complain if the roads are closed for a couple of days. It didn't really bother us back then as most in the area didn’t have to travel to work and the big bag of oatmeal would have kept us going for months. In the 50’s and 60’s farming started to change dramatically, more mechanisation meant less folk to work the land the first big blow came with the closing of the Church in 1967 it dwindled away from a full church to only 15 or 16 regulars. The minister retired and every one had to journey to Mortlach on a Sunday. Now Robbie Burns was another great Poet but we had one less known in the Glen. Mrs Finlay who stayed at Tomachar, she wrote some good poetry and a nice one about the Kirk. (see below). As time went on the Post office closed, followed by the school. This was a heavy blow to the area, it seemed that there was nothing left. Mind you things took a turn for the better, folk did start to return to Glenrinnes probably due to the cheaper price of land and houses, and of course the better way of life out in the country. We were also surprised at the number of new houses being built and I’m sure there will be a lot more built yet but things aren’t so cheap now. So I feel now that there has been much regeneration in Glenrinnes, without this new blood I’m sure we wouldn't have our community centre and I really enjoyed the Burns supper we had there this year. This was sent in and printed by the “Dufftown News” for the 3rd of June1967 issue and sent in by Mrs R Findlay Tomacher. I have heard the last Amen. Until my walls do crumble. A Church so let me be. Are memories near my door. Stop Gutterfeering inalow that bonnet and get it hoovered oot washed and polished! Ye can tak me oot for a runny up the Cabrach to see the wee lambies efter the Kirk on Sunday.